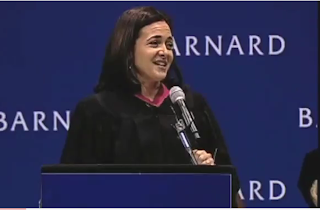 Facebook chief operating officer Sheryl Sandberg gave the commencement address this year at Barnard College -- a women's college known for its great commencement addresses about women's issues -- and rocked the house with a speech at once straightforward about barriers to women's progress and encouraging for the graduates. ...there are external forces out there that are holding you back from really owning your success. Studies have shown—and yes, I kind of like studies—that success and likeability are positively correlated for men and negatively correlated for women. This means that as men get more successful and powerful, both men and women like them better. As women get more powerful and successful, everyone, including women, likes them less. 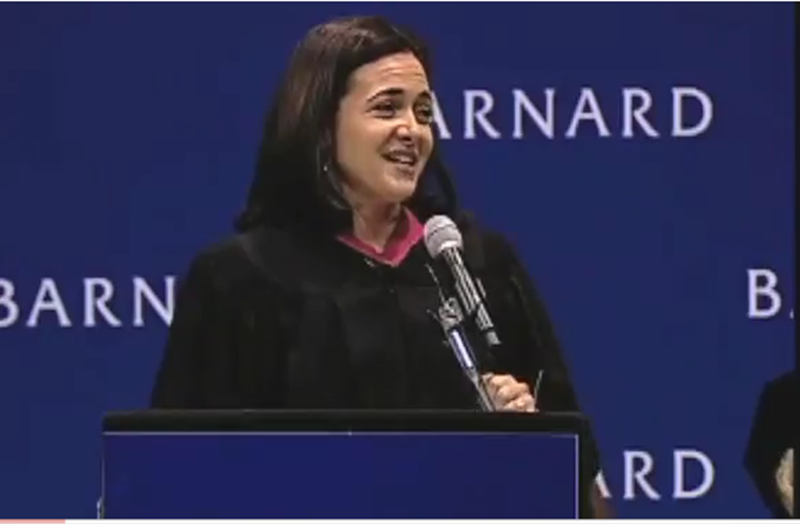 Big crowds require big gestures: Sandberg does the traditional opening for a commencement speech, greeting parents and faculty. But when she acknowledges the class of 2011, she looks straight ahead and opens her arms wide to indicate the full audience of 600 in front of her. Tiny gestures would be missed by this big crowd; the grand gesture implies the grandeur of the moment, and better yet, can be seen by all. Don't forget the personal: Sandberg takes a moment to acknowledge her college roommate, who's now a member of the Barnard faculty, with a personal message. Without having to put too fine a point on it, she underscored for the graduates two great examples of where they might go--from cap and gown to becoming a faculty member, or perhaps the COO of Facebook. Don't assume all your graduates are in their early 20s: Recently, a few commenters on the blog have told me how annoying it is to be in mid-life, graduating with a degree, and hear the speaker at commencement make all sorts of breathtaking assumptions about the age of the grads. (Speechwriters, heads-up on this score, please.) Sandberg's speech resonates with all ages, from those yet to make tough work-life decisions to those who already have, and know the wisdom of what she's saying firsthand. Why not take the extra step and make sure your remarks encompass all ages of learners? Use data, clearly: Sandberg excels at this, and rarely uses charts and graphs to get her data across. But more important, her use of data to underscore women's workplace challenges helps take that discussion out of the easy-to-dismiss emotional realm and backs it up with real research--and there's plenty of data backing up her statements. It's also the kind of data that rarely gets shared with young women, in my experience. Yet Sandberg is hardly unemotional in her delivery, striking the right balance and making herself both competent and likeable here. What do you think of this commencement speech? Leave word in the comments. Thanks for sharing this. Particularly appropriate as my daughter will be graduating from UVA in a year. I keep thinking times have changed since I graduated from the US Coast Guard Academy (definitely NOT a girl's school! ).